ECOTECA is an NGO focused on environmental protection and sustainable development. First of all, we aim to improve the Romanian legislation and to promote the EU environment related Directives and secondary legislation. Second, we use the international expertise to actively participate in the policy making and in the implementation of environment policies and projects together with relevant stakeholders. 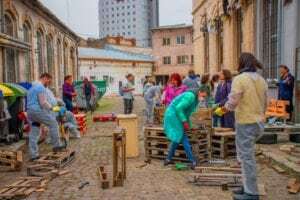 Out activity vary from integrated recycling actions in schools, to the promotion of waste management and recycling in public institutions and in the private companies located in the Bucharest area. We are part of an international consortium implementing UrbanWINS, a European project funded by the EU Horizon 2020. The project studies how cities consume resources and products, and how they eliminate the waste produced in order to develop and test innovative plans and solutions aimed at improving waste prevention and management. Ecoteca has opened in 2015 the Center for Sustainable Development, a 100 square meters space in the heart of the city where students, NGOs, and citizens meet to debate issues related to environmental protection, waste prevention and management, a place for upcycling activities, where creative minds and skilled hands join to create beautiful new objects from waste. EEB represents our link with other active organizations around Europe and a portal to the EU decision makers, it gives us a voice in policy making and shaping the future of EU. Our knowledge of national experiences can be used by other members to understand better the Romanian realities, the political approach and the technical support. Moreover, we are very much aware that it is one thing to develop policies, and another to implement concrete action plans. So far we have successfully delivered that link at the national level and we aim to ensure that link at the EU level with the support of EEB. We are very proud of our projects. 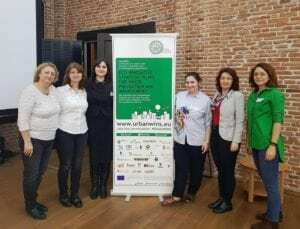 In UrbanWINS Ecoteca is the leader partner responsible for the delivery of the final outcome of the project: The Toolkit for participatory and science-based decision-making and planning for waste management that can be applied in any public authority across Europe. 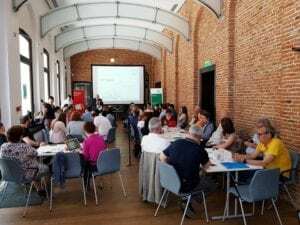 This activity is both a challenge to identify the best practices around EU worth promoting among local decision makers, and an opportunity to work together with 26 international partners with extended experience in our line of work. In our Center for Sustainable Development we have the opportunity to put in practice what we promote in theory, so the activity includes debates, events, creative teambuildings – upcycling workshops for furniture production from pallets and used tires, reconditioning used furniture, repair shops, manual recycling for textile waste, recycling workshops for pet, glass, metal etc.